It was a pivotal moment in a day of big plays. Fans, players and coaches watched as the undefeated Menomonie Thunderhawks marched down the field to the Pioneers 30 to start the second quarter. It was there that their offense stalled, courtesy of the tough Pioneers defense. Then, Menomonie elected to go for it on fourth down. Pioneers safety Nate Beulah made them pay for that decision. On fourth and ten, he read quarterback Justin Bader’s eyes perfectly, jumped the pass and, as he caught it, rolled onto the ground. Realizing no one had touched him, he got back up, ball in hand and ran down the left sideline, cheers going with him all the way to the end zone. 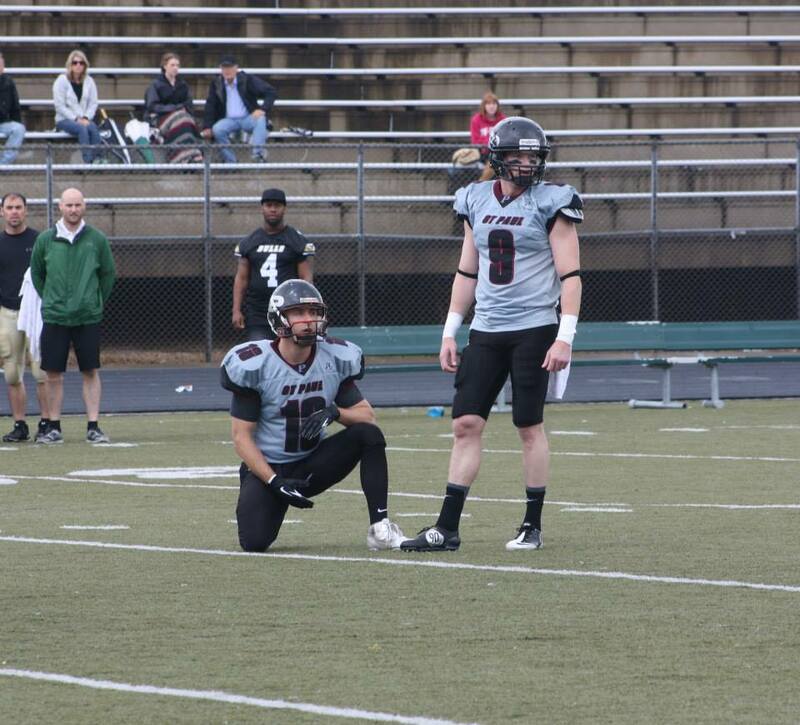 Kicker Jay Harding added the extra point and the Pioneers led 14-0. What was going through Beulah’s head as he was running toward the end zone? “Once I got in the open field I just ran!!! 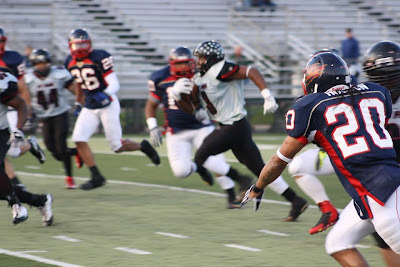 I got in front of the pack and slowed up but saw they had a guy screaming down field so I sped back up, secured the ball and thought to myself ‘there is no way I’m gonna let this guy take my 6 away’." Beulah’s play gave the Pioneers a ton on momentum. It was not, however, the lone highlight in a day full of them. Earlier, in the first quarter, running back Riza Mahmoud ran 35 yards for a touchdown on what would be an excellent day for the Pioneers running game. The team rushed for 342 yards to only 141 for the Thunderhawks. The, on the first play of the second half, it was Jake Lindsey’s turn. On third down, deep in Piioneers territory, Lindsey spotted the ball, read the pass, grabbed it and ran the length of the field for another Pioneers score. Harding’s extra point was blocked; however, which made the score then 23-0. A few minutes later, running back Vernon Johnson became the second Pioneers running back to run for a touchdown when he ran in from eight yards out to give the Pioneers a 30 point lead after Ostertag’s extra point. Indeed, Saturday was the running game’s day to shine. According to quarterback Cleveland McCoy, the play of the Pioneers physical offensive line was the key to the running game’s success Saturday against the Thunderhawks. Mahmoud led all runners with 159 yards. Johnson added 103 yards as well. In total, five Pioneers were in double figures running the ball including McCoy, running back Jamal McNutt and running back Will Winters. The Thunderhawks would sneak in a touchdown when Josh Murray caught a Troy Young pass and ran 15 yards for the score. That didn’t hinder the Pioneers running game, though. It just kept going, like a well-oiled machine. Johnson would get the call again, running 32 yards for his second touchdown of the day, extending the Pioneers lead to 37-6 after Harding’s extra point. With about four minutes to go, quarterback Bryan Trulen and receiver Justin Miles put the exclamation mark on the victory when Miles caught Trulen’s pass in the corner of the end zone. This Saturday, the Pioneers travel to Wisconsin to face the Wauwatosa Spartans. Offensive Coordinator Rob Neumann and Lindsey both said that, in order to beat the Spartans, the Pioneers need to maintain the momentum from the past two weeks and take what the defense gives them. “We will simply take what the defense gives us, and make them pay as best we can,” Neumann said. The anger St. Paul Pioneers players felt toward the Predators last week came out Saturday as aggression against the North Bank Bulls, another team made up partly of former Spartans, a former Pioneers rival. After rain and lightning delayed game time about 45 minutes, the Pioneers running game took a little more time to get going. So, the team opted for field goals instead of touchdowns, making the first one this season when kicker Jay Harding’s boot went just inside the left upright. After an interception by linebacker Billy Quistorff, former Spartan John Ostertag added three more points to give the Pioneers a 6-0 lead about halfway through the first quarter. Quite a change from last week when the Pioneers scored just six points the entire game. 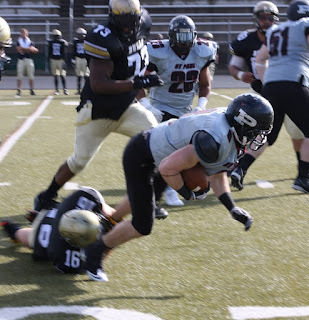 Then, when linebacker John Robinson intercepted Bulls quarterback Matt Kloss and returned the ball to the Bulls 9, the Pioneers running game got the juice it needed. In two plays, running back Vernon Johnson took it in for a touchdown. After Harding’s extra point, the scoreboard read 13-0 Pioneers and the game still had not reached the second quarter. To this point, the Bulls had yet to score and the Pioneers defense started thinking shutout. Defensive lineman Ronald Buck kept the potential shutout intact near the end of the first quarter when he sacked Kloss in the backfield. It would be one of several Pioneers sacks and hurries on the day. To start the second quarter, quarterback Cleveland McCoy and the offense went back to work. Once again, running back Riza Mahmoud came through in the clutch when his team needed him most. 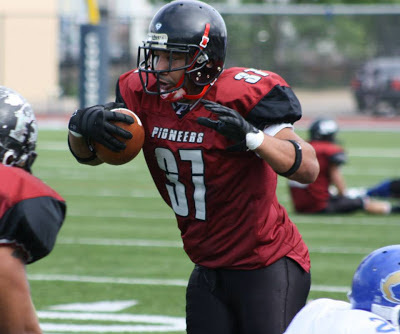 Rushing for 52 yards, he led the Pioneers to the Bulls 12 yard line, where McCoy threw a laser to tight end/receiver Joe Ubani, who ran into the end zone for a touchdown. The Pioneers would add another field goal before halftime after Jake Lindsey caught the third Pioneers interception of the day. Such was the story and, unlike last week against the Predators, it was a good one. The Pioneers did make one mistake in the third quarter, though, when Lionel Lamarre fumbled a punt and the Bulls recovered. However, before Lamarre could get too down about it, the Pioneers snatched the ball right back – courtesy of Lindsey, who intercepted Kloss for the second time. Lindsey was named defensive player of the game. How many interceptions did the Pioneers have? 4. Yes, that’s right. The Pioneers seem to have their swagger back. More evidence of that came just a few plays later when Mahmoud took a pitch from McCoy and ran 70 yards all the way to the Bulls 10. Then, McCoy threw to Ubani again. This time, Ubani wrestled the ball out of the Bulls defender’s hands. Would the Pioneers score again? No. With a defense led by Jeff McGaster, Ed Smith, Robinson and Lindsey that totaled four interceptions, they didn’t need to. So, the chapter on the first Pioneers shutout this season, 30-0, closed with a Bulls pass falling incomplete. Defensive Line Coach and Assistant Head Coach Jim Walsh said pressure, in particular on Kloss, was the key to victory Saturday against the Bulls. More of the same is the key to beating the Thunderhawks, who are currently undefeated, this coming weekend at Concordia. “To beat the Thunderhawks, we need to continue bringing pressure. And we need to tackle well if we want to keep their offense in check,” he said. The next chapter will be written at Concordia University in St. Paul on June 22, where the Pioneers will battle the undefeated Menomonie Thunderhawks starting at 5pm. Every team has one opponent they detest most – a team that gets their blood boiling and, usually, brings out their best. For the St. Paul Pioneers, that team is the Chippewa Valley Predators. The last two Elite Bowls have featured the Pioneers and the Predators. The Pioneers won both games. 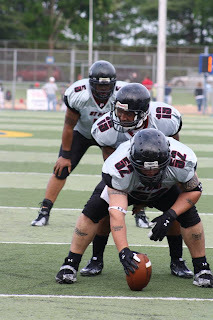 In 2011, they shut out the Predators in Eau Claire 15-0. Last season, they won 35-12 in St. Paul, capping the first undefeated season in Pioneers history. Games between the two teams always seem to be hard-hitting, dramatic and memorable. 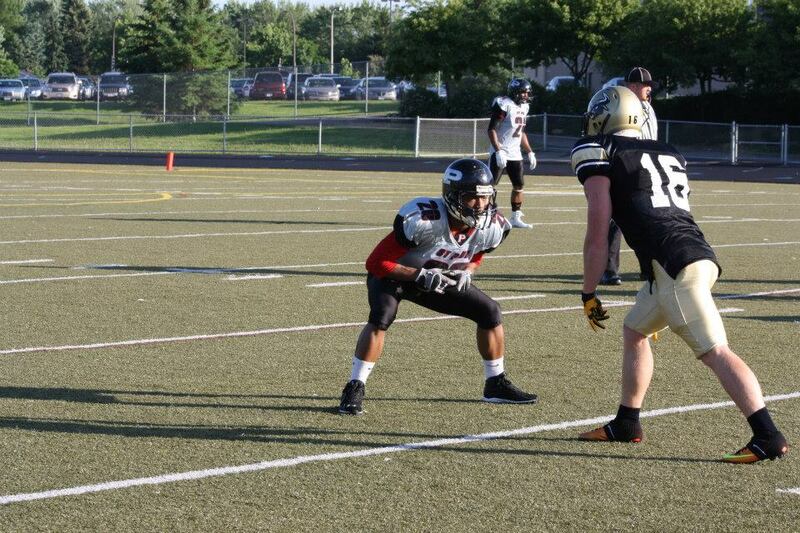 In Elite Bowl V last August, Predators receiver Reggie Houston, a former Pioneer, was ejected from the game. The year before, former Pioneer receiver Joseph Mapson – now also a Predator – made a circus catch to put St. Paul ahead to stay. Saturday’s memories weren’t so good for the Pioneers, unfortunately. The Pioneers did score first, when running back Brian Holmes ran it in about four minutes into the game to cap an impressive opening drive. Jay Harding’s extra point was blocked by the Predators, however, making the score 6-0 Pioneers at the end of the first quarter. The Pioneers had a chance to make it 9-0 when defensive back Everett Wilburn intercepted Predators quarterback Chance Garner. When Pioneers kicker John Ostertag missed the field goal attempt, that opportunity was lost. It looked like momentum might swing the Pioneers’ way again when Wilburn was in position to pick off another Garner pass along the sideline. But Wilburn, who was injured on the play, tipped the ball and Houston snared it out of the air, eluded a couple of tackles and ran down the sideline to give the Predators the lead. One they would not relinquish. At halftime, the Predators led by a point, 7-6. The third quarter again held opportunities for the Pioneers to score and retake the lead, provided by their own defense. Uncharacteristically, the offense wasn’t able to capitalize. “The [Predators] defense adjusted to what we were doing and got penetration. Offensively, everything has to come together. [That] just comes with time,” he said. 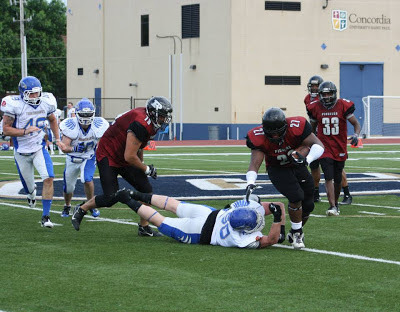 Near the beginning of the quarter, Pioneers defensive end Ed Smith recovered a fumble, giving the Pioneers another opportunity. Nothing came of it. Then, another opportunity, a long return by running back Riza Mahmoud, was negated due to multiple Pioneers penalties. Instead of beginning in Predators territory, the ball was moved back to the Pioneers’ 34 yard line. On both occasions, the Pioneers would punt the ball away. Then, just a few minutes after Mahmoud’s return, shortly after the start of the fourth quarter, the Predators scored again. This time, Montae Bailey ran it in. 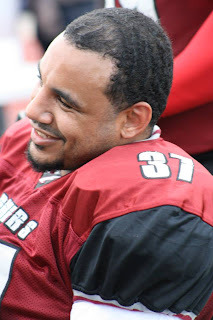 Although the Pioneers would have two more possessions, one courtesy of a fumble recovery by Terry Jones after Smith stripped the Predators’ ball carrier, with about two minutes to go, they would be unable to score. The final score of this game: 14-6 Predators. The Pioneers play the North Bank Bulls at Park High School in Cottage Grove this weekend. Next Saturday, June 22, the team returns to Concordia to play the Menomonie Thunderhawks at 5pm. 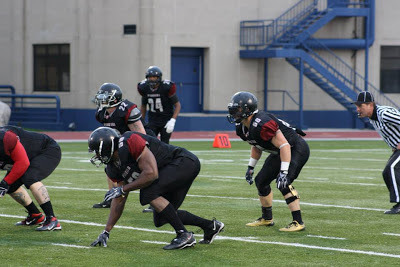 Terry Jones saw opportunity knocking during punt plays throughout the day against the Lake Superior Rage on Saturday. “We had been talking about blocking it for a while, but I’m used to blocking guys and going down field, but I figured, ‘why not,’” Jones said. 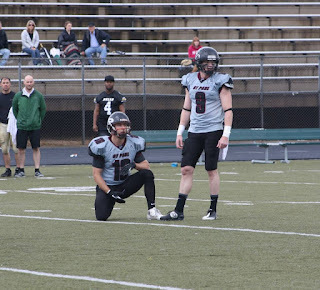 When the Rage threatened to stay unbeaten as they pulled within a point on a floating, fourth-down touchdown pass, necessity met opportunity. 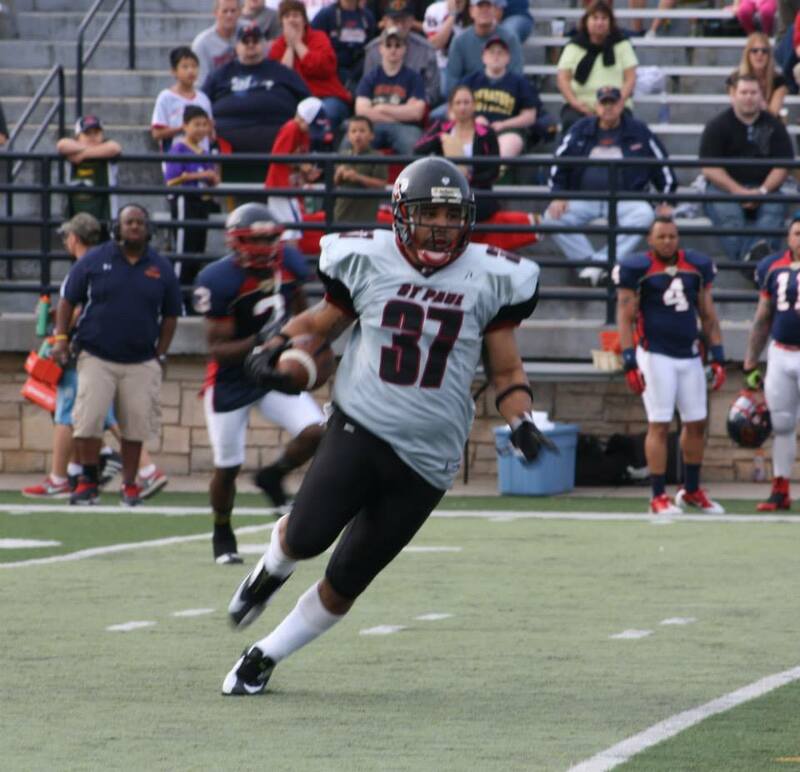 Jones, a Pioneers team captain and defensive back, made his move on the following Rage fourth down – a punt. Jones knocked the ball up the air, and it fell into his hands as he burst for the end zone and a game-securing touchdown. His score gave the Pioneers a 20-12 lead late in the third quarter, a quiet offensive quarter for the Pioneers. Their offensive drives had ended in punts and a turnover. The Rage scored once and cut the Pioneers lead to 13-12 in the meantime. “The blocked punt was absolutely huge, a huge momentum swing,” Pioneers coach Mark Heiser said. Pioneers quarterback Cleveland McCoy followed up the on the momentum two offensive drives later with a pin-point touchdown pass. In addition, the defense made the stop they needed in winning over the once-unbeaten Rage 26-18. “This win was big, it was probably one of the biggest wins we needed all year,” Jones said. Jones has made his share of impact plays prior to Saturday. He came into the game as the team’s interception leader with three. Jones also felt at home in an unusual way with the cold, fall-like weather at Concordia University’s Sea Foam Stadium. He played for the Golden Bears prior to becoming a Pioneer in 2007. “It kind of did,” Jones said about the weather conditions. Pioneers linebacker Phillip Breidall delivered exactly what his team needed when the Rage threatened to tie. The Rage had scored on their last trip to the red zone and hadn’t been denied since the first half when they’ve been inside the Pioneers 20. A fourth down separated the Rage from the Pioneers being potentially knotted up at 26-26. Breidall lined up against the Rage receiver across from him and blocked the pass to him in the end zone, which ended the drive. The Pioneers ran out the clock after retaining possession. “He did a corner route, I read it, jumped it, and swatted it,” Breidall said. Breidall has played defense only for a few years. 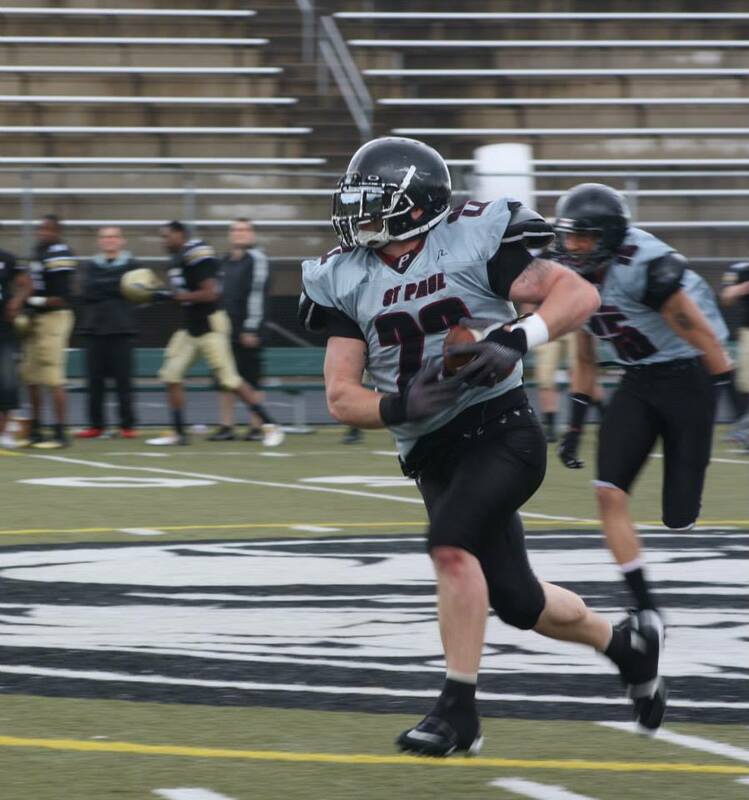 He played a running back or fullback until his junior season at Southwest Minnesota State. He switched to linebacker in his senior season. He came to the Pioneers in 2012. Saturday’s game was a unique experience in recent memory for the Pioneers. It was actually a game. A great one. 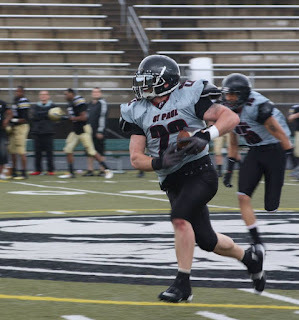 The Lake Superior Rage came into the contest undefeated at 3-0 and, historically, close games are common when these two teams face each other -- they just didn't play last year, when the Pioneers rolled to a 12-0 record and a National Championship. 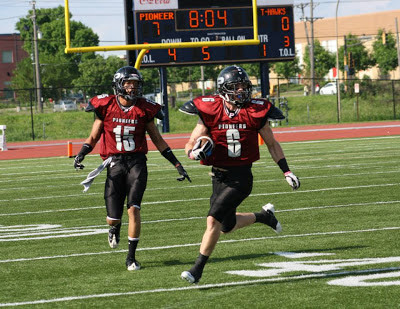 The last time the two teams met, in week 8 of the 2011 season, the Pioneers beat the Rage 9-6 on three Jay Harding field goals in Superior, Wisconsin. So, Saturday’s game at Sea Foam Stadium at Concordia University in St. Paul was no exception. In fact, no one scored until the beginning of the second quarter, when St. Paul quarterback Cleveland McCoy threw to Delane Woods, who was eagerly waiting in the end zone and jumped up and grabbed the ball for a 6-0 lead. With that scoring toss, the Pioneers found out again that they have found a special talent in McCoy. Throughout the game Saturday, he continued to showcase his athletic abilities. 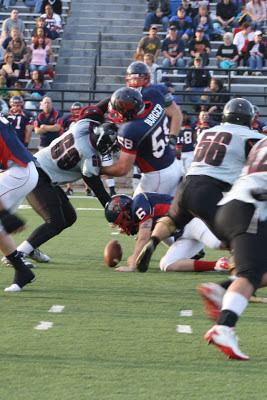 He led the Pioneers in passing and rushing yards, with 181 and 78 yards, respectively. McCoy has been great everywhere he’s been. In 2007, in only 11 games for South Carolina State, he threw 12 touchdowns and had 1,241 passing yards. After college, he spent three weeks in training camp with the Detroit Lions as well. In the last two games, McCoy and running back Riza Mahmoud have established a rapport. They connected on two touchdowns in the May 18 game against the Eau Claire Crush. Saturday, their rapport was again put on display when, later in the second quarter, McCoy threw to Mahmoud, who ran all the way to the Rage 6 yard line. Mahmoud’s catch and run set up the Pioneers second touchdown, a pass from McCoy to receiver Justin Miles in the corner of the end zone. When asked about his connection with Mahmoud, McCoy had nothing but praise for him and the entire team. “Riza is a great football player and a student of the game. He knows football. [With the Pioneers], a lot of guys know the game of football which makes it a lot easier,” McCoy said. 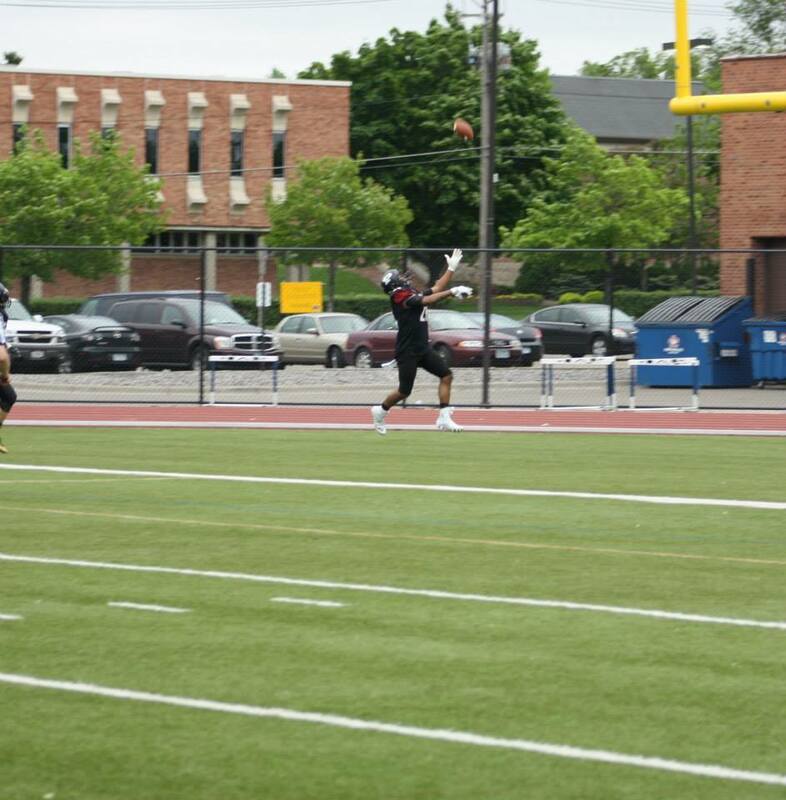 Meanwhile, the Rage added a touchdown of their own when Hollis Dukes Sr. caught a pass from quarterback Keldric Stokes. At halftime, after a competitive first half, the scoreboard read 13-6 Pioneers. McCoy and the offense weren’t the only ones handling business. The undefeated Rage scoring only six points in the first half was no accident. It was due to the play of Jeff McGaster, Nate Beulah and the rest of the Pioneers stout defense. McGaster made a statement in the first quarter when he tackled Chris Henagin in the backfield and, by doing so, probably saved a touchdown. Beulah was all over the field, making tackles and breaking up passes. After halftime, the defense picked up right where it left off in the first half when Lionel Lamarre took a Rage pass right out of the air. Unfortunately, McCoy would also be intercepted just two plays later. The Rage would be the first to score after the McCoy interception when Hollis Dukes Sr. caught his second touchdown pass. A missed extra point made the score 13-12 Pioneers. Yet, despite their best efforts, the Rage would never take the lead. Terry Jones helped make sure of that. Jones, in his first game back from injury, blocked a Rage punt and picked up the ball in the end zone for a touchdown. Lamarre said the defense sometimes tried too hard in the first half. In the second half, he said, they stuck to the basics of Pioneers football. “I think in the first half we were just trying to be too exotic, blitzing a little too much. I think the second half we went with our base defense. We knew we could match up well with them man to man so we just stuck to the basics,” he said. McCoy showcased his arm strength on the next Pioneers touchdown. From the Rage 26, he wasted no time, throwing a high spiral that Miles caught in the middle of the end zone. At that point, with about nine and a half minutes to go, the Pioneers led by 14, 26-12. Then, the Rage went to work. It started with Henagin carrying the ball into the end zone for a Rage touchdown. After an attempted two point conversion failed, the Pioneers lead was just eight with about six and a half minutes to go. The Pioneers would punt and the Rage would get the ball back with four and a half minutes to play. Would they tie the game? For about three and a half minutes, that was the question on everyone’s mind. Linebacker Phil Breidall answered it with a resounding “No” when, with about a minute left, he stepped in front of Dekeldric Felton and forcibly batted the ball down, putting the final touch on the second Pioneers win of the season. Head Coach Mark Heiser said the key to winning the last two games has been getting back to the basics, as Lamarre said. This weekend, the Pioneers travel to Eau Claire, Wisconsin, to face the rival Chippewa Valley Predators. Their next home game is June 22 against the Menomonie Thunderhawks. Game time is 5pm at Concordia University in St. Paul.